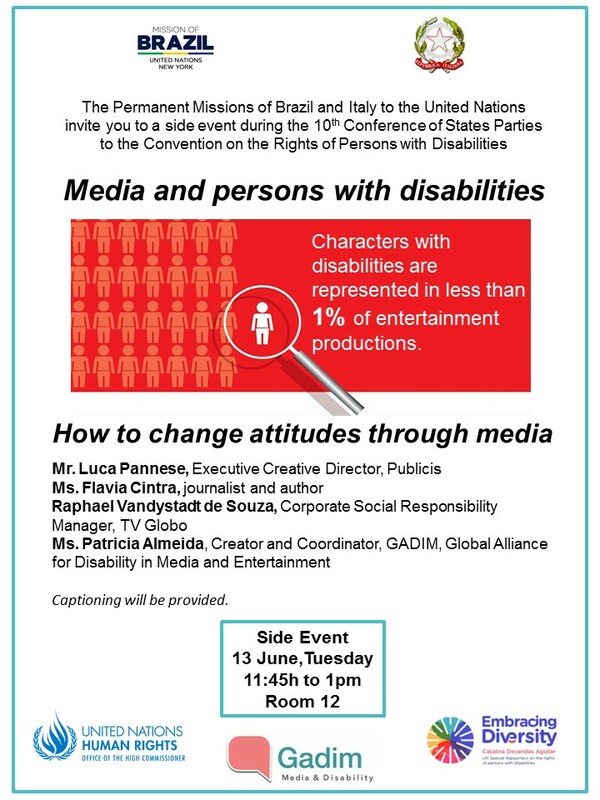 We kindly invite you to attend the side event “Media and Disability – How to change attitudes through media?”, that will take place on 13 June 2017, 11:45h-1pm, Conference Room 12, during the X Conference of the States Parties to the CRPD (COSP), at UN Headquarters in NY. Please feel free to share the attached flyer with your contacts attending the Conference. THIS EVENT IS OPEN ONLY FOR THOSE REGISTERED AT THE COSP AND UN BADGE HOLDERS. Based on Article 8 of CRPD on Awareness Raising and Article 5 on equality and non-discrimination, the side event seeks to discuss strategies that can be led at local, national, regional and international levels to fight invisibility, promote positive perceptions and combat stigma and stereotyping against persons with disabilities. Research shows that people with disabilities are present in less than 1% of entertainment productions, with 95% of characters with disabilities played by non-disabled actors (on American TV). In recent years, further initiatives are being taken in various countries to foster the participation and inclusion of persons with disabilities in the media in the press, advertising, and entertainment industries, increasing visibility: fashion shows, ads, soap operas, films, books and others. Many of these initiatives are not spontaneous. They are provoked by advocates that are actively searching for companies, agencies and newsrooms to foster the participation and inclusion of persons with disabilities in general media content. At the same time, internet and social media have become became powerful and accessible tools for self-advocates to reach out and be reached, starting online campaigns, write articles, suggesting stories and become direct sources to generate content. Panelists include professional from leading media outlets, with experience on advertisement campaigns, entertainment, and press. Luca Pannese has worked in Milan, London and New York, through McCann Erickson, Y&R, Saatchi & Saatchi and, in 2016, arrived in Publics New York as an Executive Creative Director. He has worked on Italian and international accounts like Lexus, Toyota, T-Mobile, Deutsche Telekom, Pampers and General Mills, bringing Italian warmth across the continent. In New York, he’s now running the Heineken account. With his lifetime partner Luca Lorenzini – together known as “Luca & Luca” – they have won 20 Lions in the last five years at the Cannes Lions Festival, in addition to several awards at the most prestigious advertising festivals in the world, such as The One Show, D&AD, New York Festival and many other regional awards, including two Grand Prix at the Italian Art Directors Club. Former Taekwondo national athlete, he now lives in Manhattan with his beautiful wife and their two kids who can still call him “Papà” and not “Dad.” They are the creators of video campaigns for World Down Syndrome Day, including award winning “Dear Future Mum”, and “#NotSpecial”, that reached together over 20 million views on social media. Flavia Cintra is a journalist and human rights activist for people with disabilities. She has been a reporter for TV Globo’s Fantástico program since 2010. She has worked as a consultant for the soap opera “Viver a Vida”, in which the protagonist was based on her life story, aired in Brazil in 2009 and sold for dozens of countries. She is the author of the book “Maria de Rodas”, where she tells about her experience with motherhood of twins. Until 2006, she was vice-president of Instituto Paradigma, an organization that was part of the Ad Hoc committee created by the UN to elaborate the text of the Convention on the Rights of Persons with Disabilities. She is a frequent speaker at events dedicated to the theme of human rights and social inclusion. Raphael Vandystadt is the Senior Manager of Social Responsibility for TV Globo since 2000. From 1996 to 2000, he was in charge of the Universal Channel Marketing division in Brazil. He has a MBA from the Business School of the Federal University of Rio de Janeiro (UFRJ), a Masters on Marketing from the Catholic University of Rio de Janeiro and a Masters on Strategies to Create Business and Social Value from Harvard Business School (HBS). Patricia Almeida is a journalist, human rights activist and member of the board of trustees of Down Syndrome International. She coordinated civil society’s efforts that led to the adoption of World Down Syndrome Day by the United Nations in 2011. In Brazil, she is co-founder of Movimento Down, an information organization with over 260,000 followers on Facebook, founder of news agency on inclusion and human rights, Inclusive – Inclusion and Citizenship, and coordinator of MetaSocial Institute, that has been working with the media to promote the rights of persons with disabilities for over 20 years. In 2016, she created GADIM – Global Alliance for Disability in Media and Entertainment to foster international collaboration for inclusion in media. She is currently reading for a Masters in Disability Studies at City University of New York (CUNY). The discussion will be introduced by the Moderator, followed by opening remarks and general debate with the audience.